They also manufactured a Model ‘Stringtone’, a tuning changer for steel guitars. Model 76 Attachable pickup for banjo. The pickup’s mounting bracket is bolted to the reinforcing bar located in line with the neck, under the instrument’s bridge. This particular pickup is the 2nd version of Model 76. Model 500 Attachable pickup for archtop mandolin, 1st Version, finished in chrome. Split black plastic insert; black chicken-head knob; overlapping lid on symmetrical volume pot box. Metalwork finished in chrome. This Harmony mandolin, Model H35, was fitted with an S-grille soapbar pickup in a black plastic bezel. This bezel is a black version of the guitar pickup Model 6812. The pickup would appear to be recessed, but is not. This particular pickup/bezel combination was not fitted to any other Harmony instrument. Model 500 Attachable pickup for archtop mandolin, 2nd version. Metalwork finished in choice of chrome, black or white. This gold-plated variaton to the Model 500 fitted to this Kentucky Mandolin is one of a limited edition produced to order. 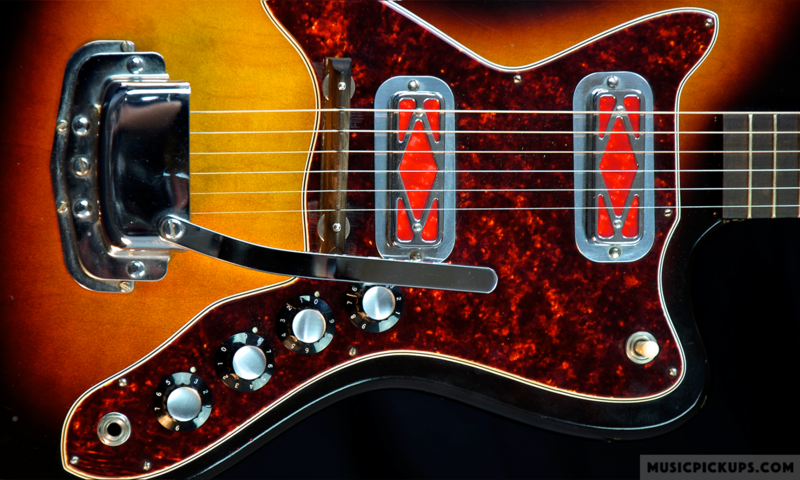 It was designed for screwfixing direct to the guitar’s pickguard, and terminated in DeArmond’s standard inline mini jack-socket. The company was flexible and accepted orders for products such as this providing the quantity was sufficient. In some instances that quantity could be as low as 50 items. A similar variation on the Model 1100 Rhythm Chief guitar pickup finished in gold was also produced, shown elsewhere in this site. Model 700 Attachable pickup with integral volume controller (earlier black milled-edge knob by Centralab) for violin, metalwork finished in white (transducer head) and black (attachment arm). Model 750-C Attachable transducer with integral volume controller for ukulele. The transducer head is secured to the instrument’s body by means of the large elastic bands shown. Model 900 Attachable transducer pickup for Bass viol. The bracket is bolted to the tailpiece and holds the transducer head against the instrument’s body. Model shown is later version with early 1960s black unnumbered fluted-edge ‘top hat’ style knob and mini-jack connection. The earliest version had a screw-in cable arrangement. The second photo shows the Model 900 as installed (Photo courtesy of Alfred Pelzer, Uetersen, Germany). Model 1300 Attachable pickup installed in an Oscar Schmidt autoharp. The long, flat, chrome pickup head is fitted diagonally under the strings. Model 1300-B Attachable pickup for autoharp, is a later version of the Model 1300 above. Model 3000 Piezo-electric single-head transducer for guitar, showing rubber bands (top right) for securing piezo head to top of instrument, and V & T controls box to side of instrument. Model 3010 Piezoelectric single-head transducer for ‘any treble clef instrument’. The piezo head is fixed to the bridge with double-sided sponge tape and the mini-jack output socket is screw-fixed to the guitar at the end-pin. Model 3200 Piezoelectric twin-head transducer for piano & harp, requires integral 9 Volt battery. Model Stringtone bridge-mounting tuning changer for steel guitar. The unit has a central camshaft that may be rotated by the lever shown. The instrument’s strings pass over this camshaft and as they come in contact with the projections on that shaft, their pitch is altered. Model 3: Tunings C6, E Flat and C7.